The Valletta Cultural Agency (VCA) was officially launched earlier today during a seminar organised at the Gran Salon within the National Museum of Archaeology, Valletta. The Agency is tasked with sustaining and strengthening the capital city’s vibrant cultural life through the creation of an annual programme of creative events developed in collaboration with artists and other Public Cultural Organisations. A legacy of the Valletta 2018 Foundation, the VCA will also uphold standards of excellence in the coordination and organisation of cultural events in the city, while encouraging access and participation by a diverse audience. The seminar also delved into the impact that the European Capital of Culture (ECoC) title had on Valletta. 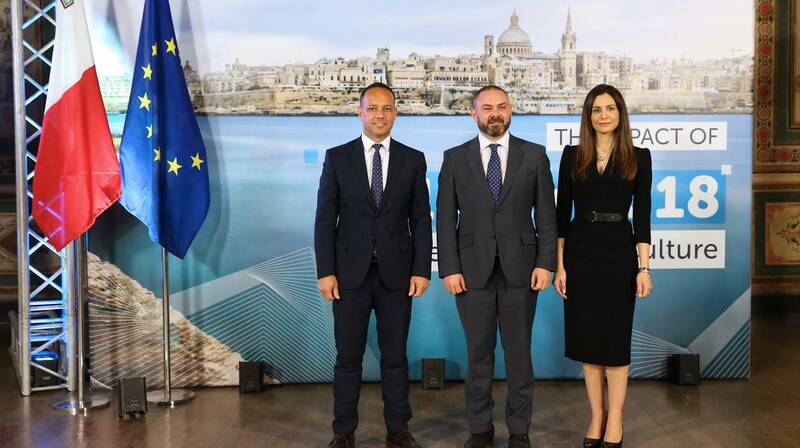 Minister for Justice, Culture and Local Government Owen Bonnici launched the Valletta Cultural Agency, and he referred to the impact left by Valletta 2018, and how it gave birth to more cultural initiatives, which led to more community outreach, not only in Valletta, but also in our localities. “Between 2013 and 2018, €84 million have been spent in cultural heritage projects, whilst almost €20 million is projected for 2019. All of this shows how culture is truly generating economic and social growth. This research has also evaluated the economic impact of the investment in Valletta between 2013 and 2019. This is expected to have generated almost €50 million in economic activity and around 230 new full-time jobs. The investment also generated additional demand for investment estimated at €83 million,” Minister Bonnici continued. In this regard, research carried out by the Economic Policy Department (EPD) within the Ministry for Finance shows that the total investment expenditure in Valletta leading to the ECoC in 2018 is estimated to have reached €167 million. The strong emphasis on cultural heritage regeneration that has taken place in Valletta over the past years is clearly evident and almost accounts for half of the investment activity that has taken place. When the embellishment of open spaces – such as squares and gardens – is included these investment activities reach almost 2/3rds of total cumulative investment. These significant investments in culture, heritage and the embellishment of open spaces promoted a substantial element of commercial interest, which supported the notable growth of tourism in Valletta. The total cumulative impact on GDP from the investment activity is estimated at €89 million, or €72 million in real terms. It is also relevant to note that data available from Jobs Plus suggests that employment in the hospitality industry in Valletta has increased by 62% between 2012 and 2018 when the same industry generated an increase of 19% in the Maltese Islands as a whole over the same period. This additional growth in employment is equivalent to an added 250 jobs in Valletta in the hospitality industry, which are likely to have been supported by the ECoC and the investment in cultural heritage documented in the EPD study. Meanwhile, full-time employment in Cultural and Creative Industries (CCIs) has increased from 9,111 as at Quarter 4 in December 2015 to 10,629 as at Quarter 2 in 2018, equivalent to a 16.7% increase over the three-year period, Jobs Plus data shows. Total part-time employment in CCIs rose from 3,073 in Quarter 4 in 2015 to 4,135 in Quarter 2 in 2018. Total employment in CCIs increased by 18% over three years, rising from 10,752 in Quarter 4 in 2015 to 12,686 in Quarter 2 in 2018. Cultural heritage sites that were the recipients of major investment include the four main infrastructural projects tied to Valletta 2018, namely; the newly opened national art museum MUŻA at the restored Auberge d’Italie; the regeneration of Strait Street and the covered market Is-Suq tal-Belt, as well as the repurposing of the Old Abattoir for the soon-to-be-opened Valletta Design Cluster, which will serve as a central hub and incubation centre in the design field. Apart from Valletta 2018’s main infrastructural projects, other cultural heritage sites within the city have also benefitted tremendously from renewed care and attention. These sites include, but are not limited to, the Grandmasters’ Palace, the Triton Fountain and the surrounding square, Admiralty House, St John’s Co-Cathedral, the Mediterranean Conference Centre, Castille Square and the recently inaugurated Ġnien Laparelli. The Valletta 2018 Foundation itself invested heavily in cultural initiatives, combining local elements with a strong international dimension, going beyond European shores to include artists from Africa and Asia. With over 100 projects and 400 events, the Foundation devised an inclusive and varied cultural programme built on a variety of disciplines, balancing large-scale mass events with targeted community interventions. Constructed on the theme of ‘An Island Wide Festa’ as a celebration of the arts and a homage to diversity, the Cultural Programme gave artists the opportunity to develop projects and showcase their work to a wider audience. School initiatives were also included to encourage children to develop their artistic and creative sides. The Foundation also collaborated with a number of local and international Artist-in-Residence programmes which saw local creatives travel to other countries to develop their projects abroad and vice-versa, with foreign ones coming to the island to work on initiatives together with local communities. From its inception, the Valletta 2018 Foundation stood for audience development through participation and for making culture accessible to all. This is the legacy that the VCA will build upon to ensure that Valletta’s continued regeneration has culture and the arts at its very core.